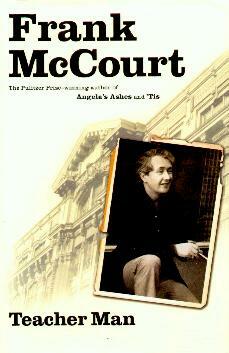 I've not read "Angela's Ashes", Frank McCourt's first book, for which he won the Pulitzer Prize. He was sixty-six years old! It seems as though one's life often gives you the theme for a book and in McCourt's case, this is true. He writes about his early life in New York as a school teacher and his vivid depiction of life there in the fifties, is true and clear. Although he grew up in Limerick, Ireland, he was born in New York and returned there to become an English teacher. His ability to bring to life, on paper, his own fascinating life, is a gift in itself. His style is flowing and thought-provoking and easy to follow and you immerse yourself into the various situations and circumstances of his story. His insecurities as a young teacher with an Irish accent among the cosmopolitan New York teenagers (wonderfully described), I also found charming. McCourt's humor is evident throughout this book and even though it's subtle, you will find yourself smiling much of the time. From Frank McCourt's life we can better understand the life of a teacher - no easy task, and one that needs more recognition than it gets. I guess you write when you're ready - don't force it - and be true to yourself - the truth pays tribute to your life. Now I've got to brace myself for "Angela's Ashes". Conclusion - A joy to read and experience.